The Sumerian civilization is considered to be one of the oldest civilizations. Situated along the Euphrates River, the Sumerian civilization was thriving and quite advanced for its time. The culture was civilized enough that it had a system of writing, an army as well as a record keeping system of business transactions for trade. Sumer developed a complex irrigation system and thrived in agriculture. How did these systems develop? There are some who believe they had assistance from an extraterrestrial source. According to Sumerian written records, gods known as the Annunakidescended from heaven. Sumerian texts detailed many stories about these heavenly gods. Author Zechariah Sitchin, translated several Sumerian tablets and wrote a whole series of books about the Annunaki. Sitchin claimed that the Annunaki gods created humanity through genetic manipulation as a worker (slave) race to mine gold and other minerals, being the reason for their visitation to Earth. Zechariah Sitchin wrote that the Annunaki were from a planet known as Nibiru, a planet that also orbits our sun but has such an elliptical orbit that it requires 3,600 Earth years to complete the orbit. These beings were not immortal but supposedly had an extremely long life span. According to ancient Sumerian writings, Earth is a remnant of a planet named Tiamat that once stood in Earth’s place. Long ago, an approach from Nibiru ended in a collision with Tiamat, breaking the planet in half. Part of the planet was shattered into pieces which became what we commonly refer to as the asteroid belt. The other half of Tiamat eventually reformed into our planet Earth. According to the ancient astronaut theory, extraterrestrials came to Earth, seeded life and created the foundations of human civilization. This information comes from many sources of ancient documents found around the globe. Although every culture has their own creation myths, they all seem to have similar elements that lead back to the true origins of humanity. There are also some that believe the Annunaki extraterrestrials are the fallen angels referred to in the Bible. According to ancient Sumerian texts, Anu was the chief deity but there were two brothers known as Enki and Enlil that caused quite a bit of confusion. It was Enki that supposedly created humans through a feat of genetic engineering by mixing the DNA of our ape-like ancestors that existed on Earth at the time with Annunaki DNA. The ancient texts state that it was Enlil that sent the flood to destroy the human race. 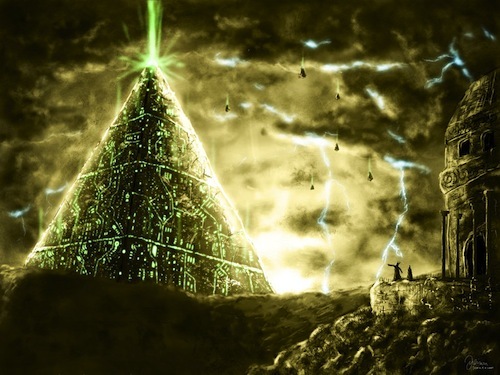 It is unknown whether the deluge was a natural event that was approaching and had been detected by the Annunaki or whether it was actually created by the Annunaki. It is also not known exactly why Enlil wanted to destroy Enki’s creation. Enlil is believed by some to be the Biblical Jehovah. Enki is also equated with the Biblical Lucifer since he was the one that encouraged the knowledge of mankind. The Bible states that God brought about the flood because humanity was inherently evil and it grieved him that he had created humans. However, if the Sumerian story of creation is true, then it may be possible that Enlil wanted to destroy humans once their usefulness as slaves had ended. According to the Bible, Noah was warned about the impending deluge and instructed to build the ark. In the Sumerian story, it was Enki that provided the warning and instruction. This is where some confusion arises about who in Sumerian mythology should be equated with the Biblical God figure. If there is any truth to the Sumerian tales or any of the global myths regarding the creation of humans, then it is possible that humanity is a hybrid species. Creation myths, including the Biblical account refers to humans as being created rather than born. Was this wording intentional to provide us with a clue about our origins? Do we still remain ignorant to the origins of humanity or are we finally waking up to the truth? What is that truth? Perhaps, the truth will be revealed in the very near future.